The Holy Quran has not used the word “Trinity” and it hasn’t explicitly mentioned three persons of Trinity together. But many verses have direct and indirect linking to this teaching and its intellectual and philosophical foundations. In some other verses, while offering monotheistic theology which is different from the New Testament, principles and basic concepts of the Trinity like child having of God, divinity, being begotten son of God and the sameness of God and Christ have been strongly denied. Description of multiple viewpoints about Trinity along with the reporting of beliefs of some Christian denominations, such as Nestorianism and Jacobites  and also studying the backgrounds of Trinity origination, especially with emphasizing on getting influenced of Roman, Egyptian, Greek and Indian beliefs and mythology  and its developments, are the subjects that sometimes has come extendedly in interpretation sources of these verses. a) Criticism of the Trinity basics: The Holy Quran has criticized one of the main fundamentals of Trinity, the divinity of Jesus (PBUH) and being the child of God in many ways. Human characteristics: Some other verses have mentioned the characteristics, needs and disabilities of Jesus (PBUH) more clearly. In These verses, in addition to provide accurate definition of the divinity meaning, a human character of Jesus is shown that is never compatible with his divinity. Accordingly, he never did miracles with his inherent strength and not only this can’t be the reason of his divinity, but also it’s a sign of his obedience and loyalty to God and that he was a God’s messenger. Monotheistic invitation of Christ: The belief that divinity of Christ is rooted in his teachings and speech has been rejected in various forms in The Holy Quran. Quran clarifies this by saying that Jesus, like other messengers, prevented people from polytheism and warned them of its horrible consequences while inviting them to monotheism (5:116-117; 3:51; 4:172). Rejection of the Christian doctrine of salvation: The Holy Quran denies the death and the crucifixion of Christ (4:157) and it also denies the basic Christian teaching of the original sin with the meaning of sinfulness of human nature (2:37-39; 20:122). It rejects sacrificing of someone for the others (2: 252; 53: 38-39; 40: 33) as well as salvation. “They do blaspheme who say: Allah is one of three in a Trinity: for there is no god except One Allah. If they desist not from their word (of blasphemy), verily a grievous penalty will befall the blasphemers among them.” (5:73). In this verse, without mentioning other persons of the Trinity, the ones who know Allah as one of the three divine personalities is frankly named “infidel” and the possibility of having more than one God is refused emphatically and it is confirmed that if they don’t desist, there will be painfully punished for their unbelievers. Christians believe that this version of Trinity is wrong and different from the Trinity they believe in and hence animadvert on Quran. Without considering the idea of the Trinity, verse 116 rejects the divinity of Jesus and his mother and clarifies that they never ask people to worship them. On the other hand, based on some reports about Christianity history, believing in divinity of Mary has been existed among some Christian sects and groups. It seems that according to the indefiniteness of the word ««ثلاثه the verse denies any form of Trinity that “الله/Allah” comes along with two other characters regardless of their identity. Two other characters can be Mary and Jesus, Jesus and the Holy Spirit or any other two hypothetical characters. Basically the verse doesn’t seek to identify the other two characters and it doesn’t want to reject Christian belief about God dignity in comparison to the other Trinity characters. But it criticizes the basics of this belief that makes Allah one of the three characters of Trinity. By the way, the expression «ثالِثُ ثلاثة» means “one of three” not “the third of three”. Not only this interpretation is consistent with Christian common belief that states the Father (Allah) has the first dignity and above the Son and Holy Spirit (the first of three), but also it talks about the high precision of Quran terms. Note that, in Arabic a subject name is made of the numbers between two to ten and is added to the source number to show particularity of possessed (ثالث) relative to the possessor of it (ثلاثه) . The phrase «ثانِی اثنَین» (9: 40) is another example of this expression in the Quran. So it is not correct to claim that Quran sayings about the dignity of God, the Father, relative to the other characters of Trinity is contrary to common belief of Christianity. After considering Trinity as a blasphemous idea and threatening unbelievers, The Holy Quran renounces divinity of Jesus and criticizes Trinity by offering God’s vision about Christ character. c) Trinity is exaggerated: The Holy Quran criticizes another fundamental concept of Trinity that says “Jesus is the Son of God” by forbidding Christians from exaggerating in religion and false sayings about God and it also prevents them from believing in three Gods while providing the correct definition of unity and oneness of God and the character of Jesus (4: 171). Commentators, considers that this exaggeration refers to Christians belief about Christ divinity ,being the son of God and God having wife. The holy Quran calls this belief wrong and interdicts that. To explain Jesus character and denial of his divinity and being the Son of God, the holy Quran relies on concepts that prove that Jesus is human and creature and it denies anything beyond that. On one hand, it denies the concept of “Jesus being Son of God” and his divinity by calling him “son of Mary”; because being “son of Mary” makes him to pass fetal period, birth and growing on mother’s lap like any other human being. On the other hand, to express the relation of Christ to God and His creation condition, Quran calls him God’s messenger , the Word of God sent to Mary and a spirit from God and it prevents Christians from believing in the Trinity while inviting them to have true belief and faith about God and his messengers. According to the Quran, despite expressing the birth of Jesus as miracle, nothing is attributed to him beyond God’s servitude. This implication is linked with two concepts in the Quran,”spirit” and “word” (4: 171). Using “word” and “spirit” for Jesus in the Quran never refers to the second and third hypostasis (Jesus and Holy Spirit) therefore, it does not support the doctrine of the Trinity. These two phrases which are mentioned in 4:171 precisely comes in the context of denying the Trinity and exaggeration about Jesus (PBUH). Despite this general meaning, specific use of “Word” for Jesus is because of his creation with the word “کن” (3:59) in an extraordinary way without intermediation of sperm. Accordingly using the phrase “Word” for Jesus (PBUH) in Quran (4:71) is never the same as Christian concept of the Logos as divine, real and independent being which is an intermediate between God and the material world and embodied in Jesus. The phrase “روح منه/a spirit proceeding from Him” (4: 171) is also contrary to the opinion of some Christians, who wrongly considers preposition “من” in the meaning of “some/بعض” while it doesn’t mean that “Jesus is a part of God and his son “. With some disagreements, commentators think that “/روح spirit” means something with a perfect purity, blowing of the breath and Gabriel and considers “منه” as a matter of formality. Based on this meaning and his chosen meaning of “Word”, Allameh Tabataba’i believes that “spirit/روح” is Jesus. “Glory be to Him: (far exalted is He) above having a son. To Him belong all things in the heavens and on earth. And enough is Allah as a Disposer of affairs” (4:171). It is written in the commentaries of this verse that the divinity is incompatible with being Father, having children and sameness to other creatures and essentially reproduction for the survival of generation is a reflection of some needs and requirements. “Christ disdaineth nor to serve and worship Allah, nor do the angels, those nearest (to Allah): those who disdain His worship and are arrogant,-He will gather them all together unto Himself to (answer)” (4:172). Discussion of three hypostases is reflected in most of the commentaries of these two main verses (4: 171 and 5: 73). Presented examples for explanation of the Trinity and to show its compatibility with monotheism have also been criticized by commentators. Unity of hypostases while being three is simulated to an oil lamp that its three components (oil, cotton and fire) and the oil lamp are one. Or it is like the sun that is one while having three components (mass, light and heat). 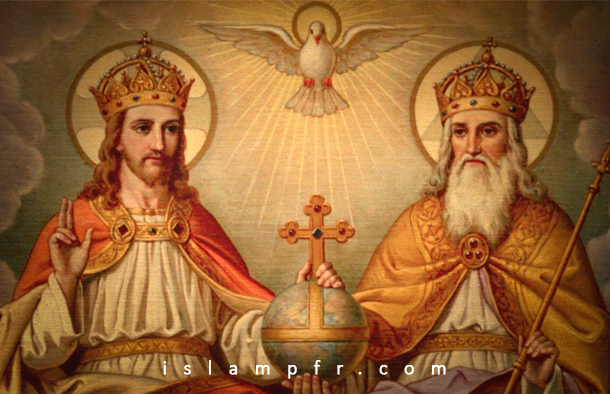 Based on the Trinity belief, God is a triple truth and Father, Son and Holy Spirit all have divinity. Emphasizing on the unity of God while having triad essence makes this belief paradoxical and difficult to understand and accept and ultimately has made it a matter which is beyond human understanding. Historical study of Trinity shows that many factors have involved in its emergence, evolution and its various explanations. The Holy Quran considers Trinity as a blasphemous, exaggerated, imported and constructed belief which is contrary to the monotheistic teachings of Jesus (PBUH) and says that Trinity believers deserve divine punishment. Based on Quran theology and Christology, Fundamentals and concepts of Trinitarian theology like God having children, Christ’s divinity, being God’s begotten son, the Christian doctrine of salvation and the sameness of God and Christ are facing serious challenges and basic problems. 3- Sayyid Qutb, Fi Zilal al-Qur’an (In the Shade of the Qur’an), vol2, page 815-816, 864-865; al-Tahrir wa al-Tanwir (‘The Verification and Enlightenment’), vol4, page 54-57; Tafsir al-Mizan, Allameh Tabataba’i, vol3, page 319-320.